Kerry Kinsella was given her breast cancer diagnosis in late 2017. In her early 40’s, breast cancer was the last thing that she was thinking about, but after the diagnosis, it was the only thing she could think about. 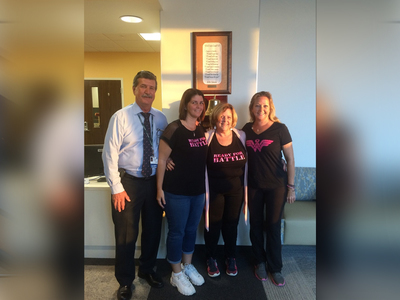 Fighting breast cancer is one thing, dealing with the physical and emotional toll the disease takes on one’s body is another. Kinsella said she didn’t have the option to deal with breast cancer, but there was something she could choose for herself. "I could lose my hair and say, its fine,” said Kinsella. “That’s how it’s going to be, but this gave me a choice, of maybe I don’t want to." That choice was given to Kerry by the DigniCap. It’s the first and only FDA-cleared scalp cooling system for patients undergoing chemo therapy to reduce hair loss. Kinsella is one of the first 20 patients at Moffitt Cancer Center in Tampa who is using the cap. "It was kind of a big surprise when they offered me something to preserve my hair that I had no idea about," said Kinsella. Kinsella’s oncology nurse, Amy Bucciarelli said it give’s patients more options than they have had before. "They've had the opportunity to not have loved ones really know that they are going through this because they want to protect them,” said Bucciarelli. “Young children. Their parents. [Sometimes they want to shield them from what’s going on] until they are ready to tell them." Kinsella said it’s not a comfortable experience, but it’s worth the results. Not losing all of her hair. “It’s like I get a brain freeze every two minutes, even as we're talking. And then after about half an hour, your scalp just kind of goes numb," said Kinsella. Kinsella has had to pay for the cap out of pocket, as her insurance doesn’t cover it. That’s a reality for many of the women who are undergoing chemo treatments. Kinsella decided she wanted to raise money for women who financially can’t afford the caps. "We have an annual cancer crawl that we started in my neighborhood for friends of mine who have been going through treatment for a couple of years also,” said Kinsella. “As it was getting bigger, I said that I wanted to raise some money for something." She has since raised about $7,500 for a fund she has set up at Moffitt to help other women afford the DigniCap. Kinsella has now completed her chemotherapy treatments. She still has her surgery and radiation to complete, but said she is looking forward to getting back to her life.